Nutrition is a key determinant of health, wellbeing and aging. We want to understand how animals decide what to eat and how these decisions affect the fitness of the animal. To achieve a mechanistic, integrated, whole-animal understanding of nutritional decision-making we work at the interface of behavior, microbiome, metabolism and physiology in the adult fruitfly. The powerful neurogenetic tools available in model organisms allow us to identify molecular as well as circuit mechanisms involved in producing the appropriate behavioral response to a specific need of the fly. We also dedicate a significant effort to the development of novel, automated and quantitative behavioral assays to understand the behavioral strategies used by the fly to make the right nutritional decisions. The combination of powerful molecular circuit manipulations, sophisticated behavioral analyses, and imaging approaches allows for a mechanistic understanding of how neuronal circuits control nutritional decisions to regulate important traits such as aging and reproduction. The Behavior and Metabolism Lab addresses the neuronal basis of nutrient decisions using the fruit fly Drosophila melanogaster, one of the most powerful and versatile genetic animal models currently available. The fly allows us to combine a wide array of tools and approaches, which include, genetic circuit manipulations, activity imaging, automated, quantitative methods for studying behavior, microbiome manipulations, and and tissue specific large scale RNAi screens. Team members use this wide array of approaches since it enables us to implement an integrative neuroscience approach, necessary to solve this whole-organism problem. 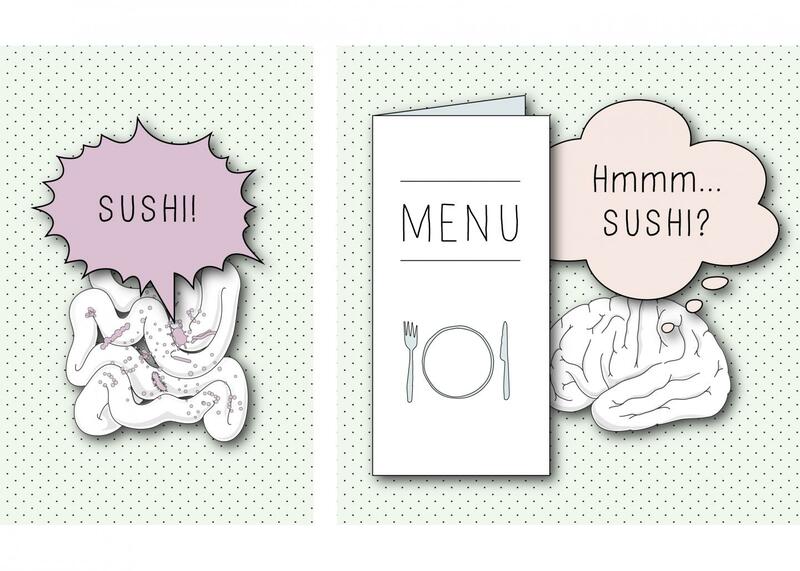 Since nutrient decisions have implications that pertain to the entire organism, the lab’s work leads it to probe neural circuits ranging from those that mediate taste and smell perception to those involved in the mating response. How do animals know what type of nutrients they need? Which circuit mechanisms are used by the brain to adapt the behavior of the animal to allow it to find and eat the required nutrients? We use genetic approaches to manipulate the activity of specific neuronal populations and test their involvement in food choice using automated, quantitative behavioral assays such as the flyPAD. Circuit manipulations are complemented with in vivo two-photon imaging approaches to visualize how the internal state of the animal impacts the activity of specific circuits. We mainly focus on three type of neuronal circuits: chemosensory circuits, postmating circuits, and circuits regulating feeding behavior. What are the molecular mechanisms used by the brain to adapt the behavior of the animal to its current requirements? To tackle this question we manipulate specific molecular mechanisms using neurogenetics and test their involvement using sophisticated, quantitative behavioral assays as well as molecular and biochemical readouts. We mostly focus on genes identified in neuronal whole-genome RNAi screens as being required for nutrient choice. These molecular mechanisms are then mapped onto known neuronal circuits characterized in the lab.The knowledge of molecular and neuronal players is an entry point for studying neuronal mechanisms of nutrient balancing and decision making at the molecular, cellular and circuit levels. How gut microbes alter brain function to affect behavior has become one of the most fascinating topics in neuroscience. Despite being an intense field of research, the mechanisms by which microbes influence behavior remain poorly understood. We have established a model in which specific gut bacteria alter feeding decisions in Drosophila. Using gnotobiotic animals we employ metabolomics, genomics, microbial genetics, and circuit neuroscience approaches to dissect the mechanisms by which these bacteria act on the brain to influence feeding decisions. This approach is allowing us to understand how complex nutritional-microbial-behavioral interactions shape decision making at the molecular and circuit level. This project is funded by a special interdisciplinary grant from the Kavli Foundation. Drosophila has become a powerful model organism in neuroscience research not only due to its molecular genetics toolkit, but also due to the successful development of methods and protocols to monitor and annotate behavior. Feeding and foraging are central elements in a majority of behavioral assays, but their quantification and analysis is a major challenge in the fly. We have developed flyPAD – fly Proboscis and Activity Detector, a method to automatically monitor feeding behavior quantitatively in individual flies. Our method is based on capacitive measurement of a fly’s interaction with the food. The precision of the measurements allows for high fidelity, high temporal resolution, and unbiased measurements of feeding behavior. This high resolution feeding anlysis approach is complemented with behavioral tracking of animals performing feeding decisions. This method allows us to extract how the behavior of the animal is altered at different levels, ranging from its consummatory to its exploratory behavior. By combining quntitative behavioral approaches with genetic circuit and molecular manipulations we are able to identify the mechanisms underlying specific aspects of decision making.